I’ve been known to shop. A lot. When I was in college, I once walked into a department store, opened up a credit card, and bought two handbags in a matter of minutes. I walked out dizzy from the rush. It took me getting a part-time job and a whole year to pay off that credit card, but I will never forget that high. Ahhhhhh. Anyway, where was I…oh yes, shopping. Your priorities change when you are shopping for your baby. You are no longer looking for the latest gear – instead you’re looking for the safest. Even more so, you want the safest items that are multi-functional, compact, and travel friendly. With baby gear, trendiness is an added bonus. In other words, I didn’t buy my stroller because Kourtney Kardashian has the same one. I bought it because it was high quality AND Kourtney Kardashian has the same one. And what stroller is that, you ask? It’s the Orbit Baby Travel System. My friend recommended it to me back in the days before weeSpring. And let me tell you, I love it. It’s not cheap, but the fact that you don’t need to buy a car seat AND a stroller helps justify the cost. The base is super sturdy, and it closes and opens with just one hand. My only complaint: the car seat and stroller base are a bit heavy, but I recognize that this contributes to the stroller’s sturdiness. It really feels like I could take this stroller for a walk through the mountains. No fancy stroller is complete without a nice handbag hanging off of it. 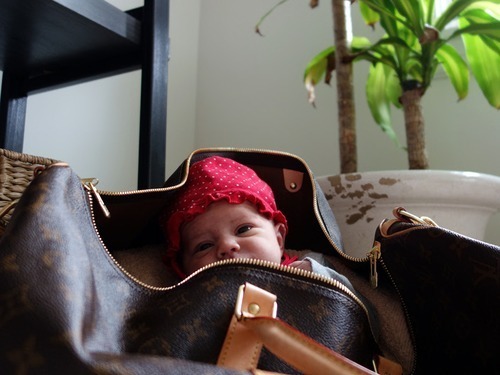 And, since handbags are clearly my thing, I wasn’t prepared to trade mine in for a diaper bag when I became a mother. So, I bought the Skip Hop Pronto Changer. It not only fits diapers, wipes, and a changing pad, but I can also drop it into my purse when I am heading out with my baby. I attached a pacifier pocket and a portable diaper bag dispenser to the handle, and and voilà! Complete baby station. Now that I’m a mom, I still love to shop, but my shopping is all about baby clothes and baby gear. Most of the time, I walk around in my pajamas covered in spit up, with the Cadillac of strollers and a nice purse. Time spent searching the web for clothing bargains has been replaced with weeSpring searches for the lightest travel crib or the most ergonomic baby carrier. Don’t get me wrong – I will always be a shopper, but first, I am a mother. Noa Arias is a first time mom to 4 month old April and lives in Westchester, a very different world from life in the city for many years. She is the founder of Cribsters.com – a local daycare and pre-school search and review site. Cribsters was conceived when she and her husband realized just how hard it was to find a local child care facility for their little one. A self-proclaimed “daycare guru”, Noa works in corporate America and enjoys watching anything on Bravo in her non-existent free time.